Part of a Mosaic pavement found in Leicester in the early 19th century. Mosaics were not just random pictures used for decoration in a Roman home, they were also used as messages about the household to any visitors. Only the wealthy could afford to have personalised designs so mosaics were a statement about a persons wealth and status. Many designs were premade and could be bought in shops much like wallpaper today. The most common mosaics portrayed scenes from history, celebrated an emperor or showed the family of the household. 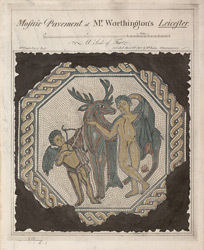 The level of skill held by the artists decreased as the distance from Italy increased, so British mosaics are simpler in design and usually less accomplished in technique.